Yes, it’s true, Col. William F. “Buffalo Bill” Cody was a heck of a shot with a rifle! 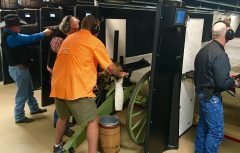 Guns played an important role in the settling of the West and visitors and locals alike can hone their shooting skills in Cody Yellowstone Country. Rifle, shotgun and pistol ranges for all. Public days Wednesday and Saturday 9 a.m. to 4 p.m. $10 non-member fee per day.